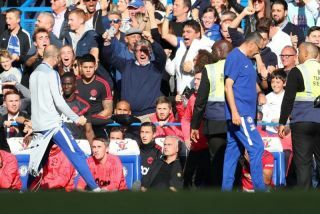 Ross Barkley scored deep into injury time to give the Blues a share of the spoils, but Chelsea coach Marco Ianni was caught celebrating directly in front of Jose Mourinho which in turn sparked a heated fracas as the United boss was held back by stewards, as seen in the video below. Speaking to Sky Sports in his post-match interview, Mourinho confirmed that he had spoken with both Maurizio Sarri and Ianni, and had received an apology from the latter over the incident which he accepted. Seemingly after all those concerned had time to calm down, the matter appears to be resolved, albeit it remains to be seen if Sarri and Chelsea take any further action on Ianni who undoubtedly crossed the line. Nevertheless, as he mentioned himself, Mourinho has been guilty of some unsportsmanlike actions himself over the course of his successful career, and so he appears to understand that emotions got the better of those concerned in the heat of the moment and is ready to put it in the past.